Filming sites for the popular tvN drama series "Guardian: The Lonely and Great God" are swarming with tourists as the show renewed its record viewer ratings at 15 percent Sunday. 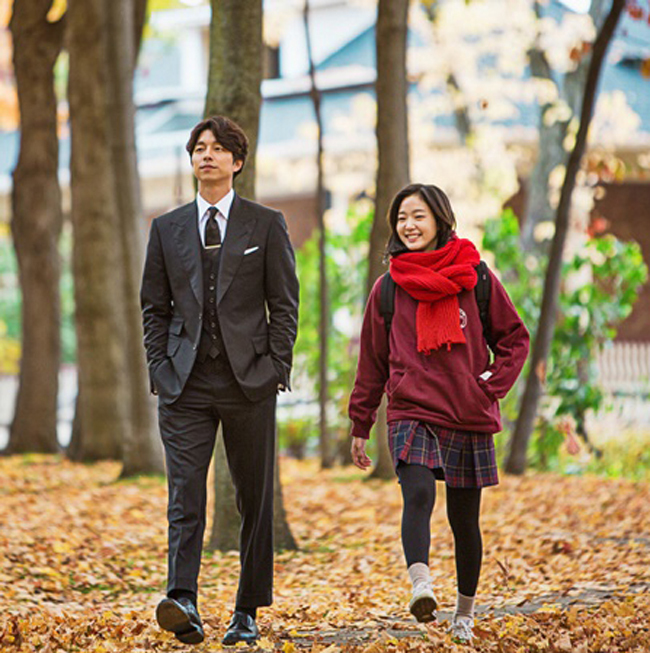 The soaring popularity of the drama written by Kim Eun-sook has led to an increase in visitors who want to follow in the footsteps of its leading man Gong Yoo, who plays an immortal goblin Kim Shin, and his human bride Ji Eun-tak, played by actress Kim Go-eun. The breakwaters in Jumunjin, Gangneung, where the couple meet and speak to each other for the first time in the fantasy-romance drama has emerged as a hot tourist destination for fans. In the famous scene, Kim is accidentally summoned by Ji who blows out her birthday candles and makes a wishe, with a bouquet of buckwheat flowers, a symbol for lovers. Merchants rent a bouquet of flowers, a red scarf, and an umbrella, for 1,000 won each, so that visitors can recreate their own romantic scene from the drama. "After I saw the beautiful seaside featured in the drama, I went there over the weekend. With many tourists wanting to take photos there, I had to wait in line for more than ten minutes," said tourist Kim Ye-min, 31, to a local daily. Social network services have seen many edited photos of the place where people stand like the actor or actress, replicating the scene using mobile applications. Hanmi Bookstore, a small used bookstore painted in vivid yellow in Incheon, is also frequently featured in the drama and has emerged as another hot place for fans. The bookstore owner Jang Won-hyek said he feels the drama's popularity first hand. "The number of visitors has jumped dramatically to more than ten times over the weekends and tripled on weekdays," he said to a local daily. "After the drama, I began to see more foreign tourists as well." Seated in the old alley where many used bookstores once prospered, the shop is one of a few remaining in Incheon. "The streets used to bustle with people. But it has been reduced to a place that just a few people visit nowadays. We expect the area will regain vitality thanks to the drama," Jang added. The classic western-style Unhyeon Palace within Deoksung Women's University in Seoul, featured as the white mansion where Kim Shin lives, is also attracting tourists. The place was also featured in the 2006 hit MBC drama "Princess Hours." Shooting spots in Gangwon Province, including Yongpyong ski resort's Dragon Peak at the top of the Mt. Balwang, where the couple goes on a date is attracting skiers this winter. Woljeongsa Temple's fir tree forest and Cheongna Lake in Incheon, where Kim tells the secret of the sword and reveals that Ji is his first and last bride, have all emerged as must-visit places for "Guardian" fans. Incheon City plans to develop tours for "Guardian" fans, putting up sword shaped sign posts to help them.